Our moment-to-moment task is to keep the Divine Name on our lips “His Name is like fire burning in my heart” (see Jeremiah 20:8), we ought to do everything to serve and love. By no other name are saved but Jesus’. The Spiritual Exercises are a great gift to the Church; his rules of discernment, contemplation on Divine Love, and thinking with the Church are key to the spiritual life. In the 16the century Loyola wanted to serve the Lord in model of Saint Dominic and Saint Francis; what ended up happening was a renewal in the manner by which the Church is apostolic — and he (and his spiritual sons had great success until the 1960s. Today, mentioning the word Jesuit is to say “I follow a left-leaning agenda.” One can think of various theologians, philosophers, writers and pastoral ministers who are ordained and professed members of the Society of Jesus. The disasters in ministry, hence, orchestrated by the Jesuits has been scandalous. 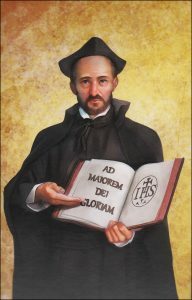 We need Loyola and the true beauty of the Society of Jesus; we need real men; we need men who will sacrifice themselves for the greater glory of God; we need Jesuits who will preach the received Gospel and to administer the sacraments according the to mind and heart of the Church. What we don’t need is the faithless Jesuits who do not think with the Church and follow closely what their sainted founder (and the patrimony of saints and blesseds) set out to do for Christ Jesus and His Church.